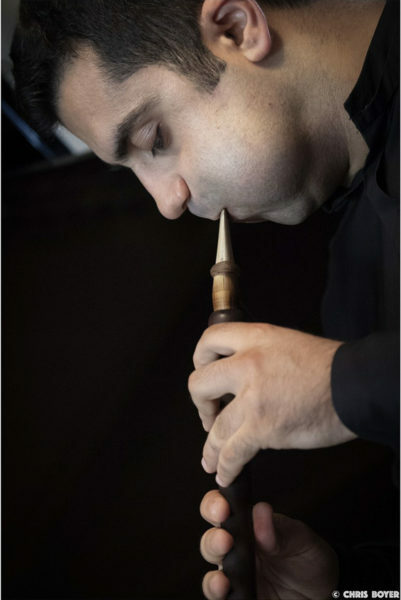 Norayr Gapoyan plays the duduk, an Armenian woodwind instrument. He was born in Armenia, in the city of Gavar. He attended the art school in his birthplace, the village of Karmirgyugh and trained at the Duduk Department. In 2010 he joined the Yerevan State Conservatory, named after Komitas, and in 2016 he graduated with a master’s degree as a Duduk artist. He has won several national and international prizes. He plays in the State Folk Orchestra of the Republic of Armenia, in the Gurdjieff Folklore Ensemble and in the Van Project Ensemble. He also founded ‘The Birds’ (avant garde folk and ethnojazz band). He has participated in many concerts in various countries such as the United States, Canada, Brazil, Europe, the United Arab Emirates and Argentina. In 2018 he took part in the national award ceremony “Tsistsernak”, where he was nominated and awarded “The best musician of the year”.